This original, vivid, disturbing, and slyly humorous collection presents ten new versions of ways in which characters are trapped by delusions, and as many versions of “Protectors” to slap them upside the head. I find that I’m uncomfortable with the stories—Gaston’s intention, I’m sure. I cringe, I wince. 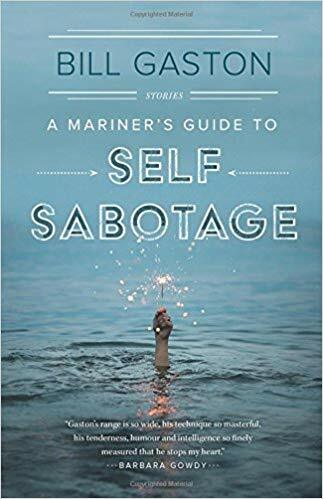 I try to avoid similar situations to those in A Mariner’s Guide to Self-Sabotage, by crossing the street, turning down a party invitation or getting off the bus before my stop. But here they are, under the skin. In the first story, “Levitation,” Bett, after being offensively treated by her husband at a party with his colleagues, begins to see her situation with clarity. It’s an offensive party—cliquey, Mad Men themed, an embarrassing, reductive send-off for a retiring female manager. I admire Bett’s sharp dissection of the social mores of the party, and of her husband’s hypocritical playing of the mutual-bond-card right after his deep betrayal of her. Bett is funny: she defines hummingbirds as “roofies for hippies,” a nice pun (and a sly reference to one of Gaston’s slyest and funniest earlier stories). But Bett, then, like Betty Draper of Mad Men, roofies herself with several glasses of wine and some marijuana, and we doubt both her capability of defending herself from her manipulative, controlling, disrespectful partner, or of extricating herself—a non-productive, childless artist who has clearly been supported for decades by her husband’s salary—from her fifties-style dependence. The trade-off of autonomy or authenticity for marriage is played out in the story, “Anonymous,” in which Clare, in lust with both her boyfriend’s perfect body and his devotion, makes lists of the things she hates about him, in order to keep herself from the temptation of accepting the proposal she knows is imminent. Her dislike—disgust, even—of Bo is vivid, visceral, convincing. She can’t stomach him. But her lust is a kind of greed. She can’t turn him down, either. The impulsive action she makes in order to undermine her own squeamishness about Bo’s personality defects had me covering my eyes, as if I were about to witness a train wreck. But I laughed with horror, too, as one character does when he finds himself unavoidably running over a seagull. Valerie, in “Critic,” on the other hand, has her inner critic working too hard on the subject of how her date and potential lover seems, actually, to be “a good catch”. He is comfortable with her independence and power, even with her considerable and unprovoked bitchiness. A little self-perception—by way of a magical, mnemonic carp—distorts Valerie’s self-protectiveness enough that she doesn’t shut down this connection that seems, to readers, beneficial—or, to Valerie, “almost good enough.” Humour and self-awareness, the gifts of the traditionally wise fish of folk tales, wake Valerie up. Only two other characters, beside Valerie, achieve awakening, though not redemption, through the intervention of Protectors, malign and benevolent. The nameless narrator of “Carla’s Dead Wife,” puts two and two together just in time to avoid mortally offending his pregnant sister with an ego-driven revelation. His new understanding, though, is “confusing in a way that will have no end to it.” The narrator of “Oscar Peterson’s Warm Brown Bench” is given a gift of complete presence in his piano-playing through the generosity of Oscar Peterson’s literal warmth of character. At least two of the characters—Arnie in “Kiint,” (pronounced Sint, which sounds like both sinned and saint; Arnie is perhaps the fool-saint, rather than the eponymous saboteur) and Joel in “The Church of Manna, Revalator”—who undeservedly gains, then loses, a fortune—are unsophisticated beings, perhaps even intellectually impaired. Are they an easy way out of complexity? Their arcs rest on arbitrary conditions, like stories about children with rare genetic diseases or dogs that find their ways home over hundreds of kilometers. What are they for? I suppose the answer is that they, in their stories, are also Protectors. Because we are all, at least some of the time, too stupid for our situations, objects of dark humour, gullible and doomed. Still, I find the subtler self-sabotages of the collection more interesting. In the last story in the collection, “Drilling a Hole in Your Boat,” which contributes the book’s title, the protagonist’s proposal—to take his very sick wife out in their boat, drug them both with Dilaudid, and commit murder-suicide by scuttling the boat and drowning them both—is shocking, abhorrent; yet it isn’t. The second person is used, inviting the reader’s identification and complicity; the protagonist plans the journey with a detective-novelist’s attention to detail, and there is a great deal of narrative desire to see it come out, unhampered by the well-meaning interventions of the mechanic. But we are expected by this point in the collection to mistrust personal narratives, and to see that the mariner, is deceiving himself. He convinces himself that his wife must know what he’s up to, and tacitly approve. He reads his daughter’s palpable grief over her mother’s terminal illness as selfishness, sullenness, and decides she’s rather have the life insurance than a living parent. And yet he thinks to himself: choice being better, so much better, than no choice. This is a frightening story, more frightening in its skilful use of language and image and sympathy. The point of the Protectors, in Buddhist thought, is that they slap us awake, and by so doing, rip us from the drugged sleepwalking of our conditioning, our delusions, and allow us real, conscious choice over our actions. 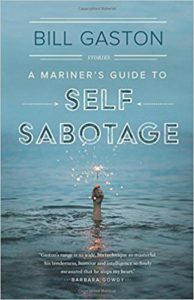 We can act; we can choose against our perpetual self-sabotage. We are awake, and so free. Karen Hofmann has published fiction and poetry in several literary magazines, including Prairie Fire. A first collection of poetry, Water Strider, was published by Frontenac House in 2008 and shortlisted for the Dorothy Livesay prize. Her first novel, After Alice, was published by NeWest Press in 2014, and a second novel will be published in 2017. Karen teaches literature, composition, and creative writing at Thompson Rivers University in Kamloops, British Columbia. Her writing explores relationships, especially of family, and the landscapes of the BC Interior.